Simple, easy, tasty, and healthy. This recipe was on the Quaker Oats cover and I tried it with slight modifications and the result was good. This is a very easy option and good for people who don’t prefer a sweet breakfast of oats cooked in milk and sweetened with sugar/honey/jaggery. Soak the tamarind in half a cup of warm water. Keep aside for 5 minutes. Squeeze the tamarind to extract all the juice discarding only the remaining pulp and retaining the water. Heat oil in a wok. Add mustard seeds and let them crackle. Add chopped garlic and curry leaves. Let the garlic turn light brown. Add coriander powder (you may replace this with rasam powder also). Stir and then add plain water and tamarind water. Add jeera powder and pepper powder. When water starts boiling, add rolled oats. Stir and cook until the oats gets cooked and the mixture thickens (approximately 5 minutes). In a large vessel, mix the beaten rice flakes, finely chopped onion, grated coconut, sugar, finely chopped coriander, and salt. Use your hands to mix the ingredients together. Crackle mustard seeds in oil, add a pinch of turmeric, curry leaves, and chopped green chilly, and add this to the poha mixture. Mix well again using hands. 1. 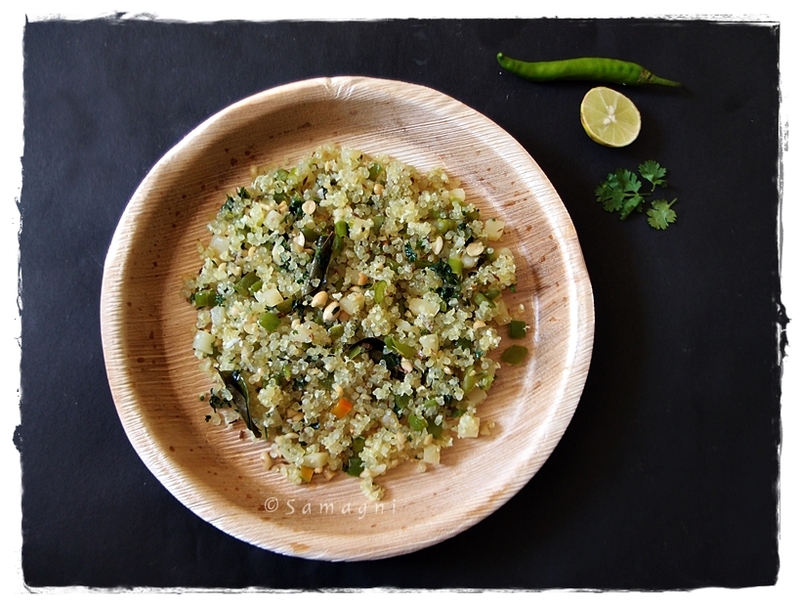 Serve with boiled green mung dal (sprout for better nutrition) with a pinch of salt garnished with grated coconut and a tempering of mustard seeds. 2. 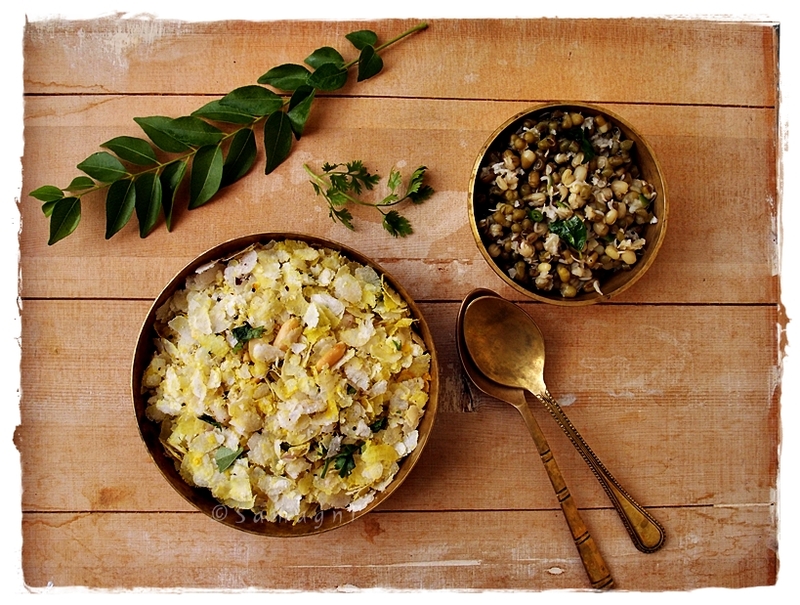 You may add roasted peanuts to the poha. Never before have I thought of, collected info and ingredients, prepared, and executed a recipe with such urgency and efficiency. 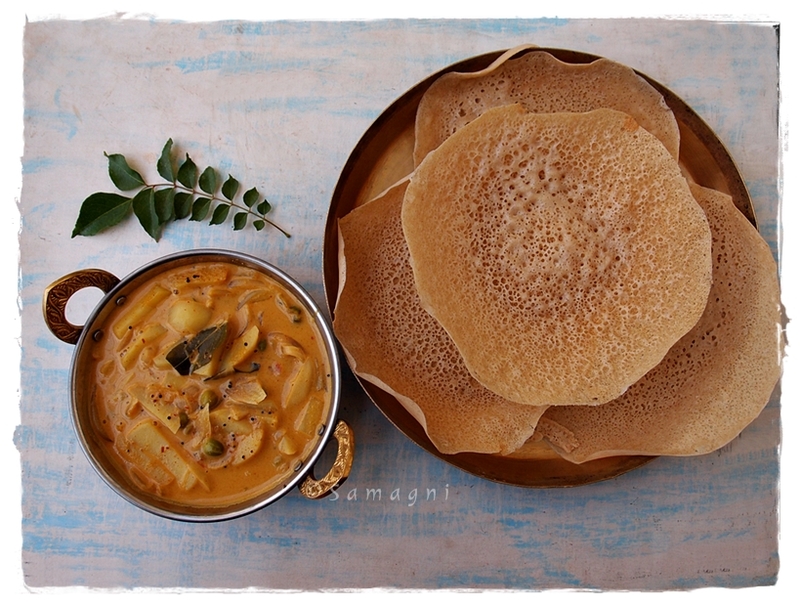 Appam is one of my favorite breakfasts and I wanted to try appam with Foxtail/Thinai millet. I was really excited about this gluten-free and healthy breakfast option. Soaked the ingredients (randomly without any reference), ground the batter yesterday evening. I tried to think of what side dish to prepare and suddenly remembered the vendakka mappas (a type of Okra stew, a typical Kerala preparation) curry that used to be my favorite while living in Kochi. Being unfamiliar with the dish since this is not prepared in our region, I read some recipes online and tried the same recipe with potato instead of okra. Both appam and mappas turned out to be excellent. Had to share this immediately with Samagni readers. To learn how to make appams, click here. I did not add yeast to the batter but yet it turned out fluffy and crisp at the edges. You may choose to add skip it. Heat oil (coconut oil is preferred because this is a Kerala dish) in a pan and add mustard seeds. When mustard seeds splutter, add chopped ginger, garlic, slit green chilies, and curry leaves. Saute for a minute. If you are adding cardamom pod, clove, cinnamon, add it at this stage. Add sliced onion and cook for 5 mins. Add chopped tomatoes. Stir and cook for 2 minutes. Add all the masala powders, i.e., coriander, chili, turmeric, pepper, garam masala. Saute and cook for 2-3 minutes. Add chopped potato and green peas. Stir. Add a cup of water. Empty one packet of coconut milk powder into one cup water to make a thin coconut milk. Add this to the vegetables. Close with a lid and cook for 10 minutes stirring occasionally until gravy thickens and potatoes and green peas look well cooked. Add salt, cover and cook for 2 more minutes. Mix the other coconut milk powder packet in half a cup milk. Add this thick coconut milk to the dish, simmer and cook for 2-3 minutes. Remove from fire. Garnish with freshly ground pepper, if desired. You may use some cashew nuts while making mappas. Soak the cashew in warm water for 5-10 mins. Grind to a smooth paste and add this to the gravy when you add the first set of coconut milk. Its summer! Here is a quick breakfast sandwich to make the most out of your mango picks. Works well with kids of all ages. Wash, peel, and cut the mango into thin, flat slices. Keep aside. Place an iron skillet on fire. Maintain fire in medium. Apply some butter on the skillet and place the bread slices. Roast only one side until light brown and crisp. Remove from the skillet and place on a plate. With the buttered crisp side of the bread facing up, place a cheese slice and layer mango slices liberally. Make sure that the mango/cheese touches the crusty side of the bread. Cover with a bread slice with buttered side facing the mango slices. Press the sandwich gently and cut it into two triangles or as desired. You can also leave the sandwich open face. You can add some black pepper for the zing if you don’t mind it crowding the mango experience. This must be served immediately. Toast only one side so that the side that you bite into is soft. As you dig more, you meet the crust and the sweet and salty mango cheese combination.